SUMMARY: What exactly is the “Festival of Taang Lôke Kwaam Banterng Sumitchanani“? It’s a 24-hour water balloon blitzkrieg, a ruthless talent competition, and an earth-scorching, take-no-prisoners bacchanalia. It’s the one day of the year when everyone has a shot at finding true love–even a rapacious, over-sexed turtle god. It’s a celebration of hobos and heartbreak, Lionel Richie impersonators and banana-brandy-flavored rice wine. It’s The Festival of Earthly Delights. Boyd Darrow is a young American living in Puchai, a tiny Southeast Asian country that tourist brochures refer to as “The Kingdom of Winks.” In a series of letters written to a mysterious recipient, Boyd tells of the delights, humiliations and brain-bending misadventures he experiences while adjusting to life in the small college town of Mai Mor. He and his somewhat less-than-faithful girlfriend, Ulla, were hoping to start their lives over in Puchai, but Puchai has an agenda all its own. 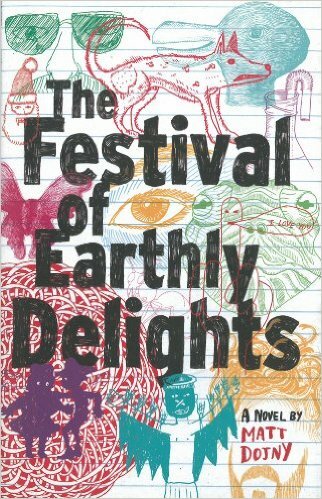 Hilarious and wise and fiercely original, The Festival of Earthly Delights is a no-holds-barred celebration of love, cultural differences, and one man’s reluctant embrace of the sensual pleasures of this world, in all their awkward, enigmatic glory. THE BACK STORY: When I was a kid, I was a voracious reader and writer; I even wrote a novel when in Sixth grade, and attracted the attention of a literary agent who shopped it around (garnering a stack of very considerate rejection letters). But, in college, I had a creative writing teacher who was deeply unenthusiastic about my work—and a drawing teacher who was very encouraging—so I changed my major to Studio Art. When I first moved to New York, I spent a fair amount of time trying to make it in the art world, but at some point—about six years ago—I began to grow tired of that particular scene. I found it depressing to have piles of unsold paintings cluttering my small apartment; and, when I did sell work, it made me sad that I was never going to see it again—it felt like selling off one of my kids. I started thinking about doing something different. A while back, I’d spent some time living in Southeast Asia, and had written some extraordinarily long letters to a close friend. This friend, also a writer, suggested that the letters might be good fodder for a novel. I liked the idea of making a reproducible object such as a book—something that wasn’t a precious singular entity like a piece of art. (Also, I figured that if my writing turned out to be unpublishable, at least it could remain hidden inside my hard drive rather than taking up storage space.) However, by that point in my life, I didn’t really consider myself a writer, and the idea of undertaking a novel seemed somewhat ridiculous. I decided to give it a shot anyway. I also find that the creation of a fictional world makes me more engaged in the actual world. I’m very intuitive when I work, and have a superstitious (and possibly narcissistic) belief that the world is constantly sending me clues as to what should be included in a story. Crafting a fictional universe gives me a satisfyingly god-like sensation. I recommend that everybody give it try. WHY THIS TITLE? : The title, as well as the basic concept for the Festival itself, came to me in one fell swoop while taking a shower one morning (as 99% of good ideas tend to do). I ran through several hundred other alternate titles, but this was the one that stuck. WHY WOULD SOMEONE WANT TO READ IT: This book is for armchair travelers, armchair detectives—and, really, anyone who enjoys sitting in armchairs. 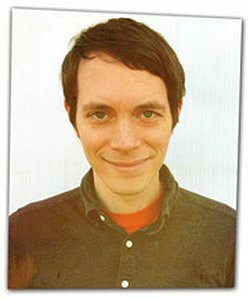 AUTHOR PROFILE: Matt Dojny’s debut novel, The Festival of Earthly Delights, was published by Dzanc Books in June 2012 and is now available in paperback. Dojny’s work has recently appeared in Electric Literature, A Public Space, The Collagist, Better Magazine, and Vol. 1 Brooklyn. Visit him at mattdojny.com, or at hiphopisthefuture.com, where he posts a drawing a day. Our flight from Newark was seventeen hours and twenty-three minutes, non-stop. Ulla took a pill and was unconscious for most of the trip. I spent my time playing solitaire and drinking tiny bottles of Boodles gin mixed with Puchalicious-brand tamarind soda. After a while, I put away the cards and opened up our Pocket Adventure: Puchai! guidebook. I’d meant to read it before we left, but had never quite gotten around to it. “The Kingdom of Winks” is a phrase that conjures many images: Saffron-robed monks and tantalizing bar-girls—sun-drenched beaches and moss-encrusted mountains—the exotic nightclubs of Dakhong and the picturesque rice farms of Hattanai Province—world-class hotels and soft-adventure experiences in the jungle. Puchai may be miniscule in size, but irregardless, this charming country offers a myriad of cultural and sensual contrasts for the visitor on holiday. Whatever you seek, Puchai’s scintillating blend of age-old tradition and modern amenities makes for the most unique holiday available to date. Truly, this land of contradictions—by turns zestful and tranquil, resplendent and subtle, soulful and hedonistic—never fails to delight your senses… and/or your spirit. I put the guidebook down and rested my forehead against the window, barely able to keep my eyes open. The sun was rising and I watched the clouds—thin and feathery and edged with pink and gold—slowly creep across the purplish sky, coming together as if to form characters in some forgotten language. And then, like a film reel stuck on a frame, their motion abruptly ceased. My heart hammered in my chest when I saw that they’d taken the shape of six enormous letters. My own surname, written across the sky in fire. The airplane’s engines had come to a complete stop, and we were hanging silently in mid-air. I continued staring out at my name, now grasping its meaning: the plane was about to crash, and in a few moments I would be dead, along with everyone on board. I glanced around at the other passengers—wondering if each of them saw their own name in the clouds—then squeezed my eyes shut. I was hoping to see highlights from my life flashing by in rapid succession, but all I saw was empty blackness. And then, as if you were sitting in the seat behind me, murmuring the words into my ear—I heard your voice. “I screamed because you were flailing around in your sleep and spilling soda all over the place,” said Ulla, taking my pillow and rubbing it in her lap. I searched the sky one more time. “I saw—I mean, I thought that we were going to…” I felt my eyelid give a little twitch as the passengers around us began to whisper to one another. “Never mind,” I said, pressing my hand to my eye. Our plane was now making its descent into the soupy yellow smog that hung above the city of Dakhong. I saw that we were passing over a railroad junction, and instinctively I lifted both my feet off the floor—either for good luck, or to ward off disaster. I forget which it is. A driver hired by Mai Mor College was waiting for us at the gate, holding a paper plate with “MR. + MRS. DARROW” scrawled across it. His rendition of my name was reminiscent of the DARROW in the sky—it almost looked like the same handwriting—and the similarity made my stomach tighten. Ulla and I changed dollars for prik at the airport, and then we were driven to the train station in a pini-mini—a small, noisy, three-wheeled vehicle that looks like a cross between a rickshaw and a Vespa. We rode through the industrial outskirts and entered the traffic-clogged streets of downtown Dakhong, inching past a succession of skyscrapers, markets, exotica clubs, shantytowns, and temples (which are known as mâdans, Ulla informed me—she finished reading the guidebook weeks ago). Blue-black fumes poured out of the tailpipe of the pini-mini, and by the time we reached the train station, I felt another one of my out-of-body experiences coming on. After some difficulty, we managed to purchase two one-way tickets to the town of Mai Mor. I’d wanted to spend a few days looking around Dakhong, but Ulla is eager to settle in before she starts her new job. She’s been hired by Mai Mor College’s Faculty of Theatre Drama to help organize and stage-manage the big talent show (the Expo Taang) that’s held in conjunction with the town’s annual “Festival of Taang Lôke Kwaam Banterng Sumitchanani.” My own job prospects are sketchy, although Ulla’s new boss—Mrs. Haraporn Leekanchanakoth-Young—suggested in her letters that I might be able to work at the English-language school run by her husband. I’m anxious to start earning some prik: I owe Ulla nine hundred and eighty-three dollars for my plane ticket here. I’ll bet I can guess what you’re wondering at this point, Hap: What are Ulla and I doing here? Why Puchai? There are a lot of reasons. One reason we left New York was because Ulla had harbored romantic ideas about moving to a foreign land ever since her junior year abroad in Luxembourg. Another reason was that—apart from my freelance job designing brochures for the Department of Public Health and Mental Hygiene—I didn’t have much going on back in the city, and I thought that a change of scenery might do me good. And another reason I wanted to leave home, if you really want to know, was the White Sikh. I call the White Sikh “the White Sikh” because he’s a white man who is a follower of the Sikh faith. I also call him the White Sikh because I don’t like saying his actual name—Shawn Talbot-Singh—aloud. He was Ulla’s boss at Gelder & Ventry, and, not too long ago, I learned that Ulla and this Sikh—a married man in his mid-40s, with three young children—had been meeting up in the stairwell during their lunch break for a daily make-out session. After this revelation, Ulla and I went into a tailspin that lasted for several weeks, though we never broke up for more than an hour at a time. When I had to go to the Catskills for Maury’s wedding in January, Ulla decided to join me at the last minute, and we ended up having an unexpectedly fun time together—it was as if our problems vaporized as soon as we left the city limits. On the drive home, Ulla informed me that she’d heard about a job opportunity in Puchai, and was seriously thinking about applying. We discussed it for a while, and after a stretch of tense silence, she asked me if I’d like to go with her. You said: Let’s do it. Over the years, I’ve gotten used to hearing your voice in my head—prodding and cajoling me, as if you were looking over my shoulder, judging every decision I make. Usually I’m pretty good at ignoring you. This time, though, an idea occurred to me: as an experiment, I’d try doing exactly what you told me to do, and see if my life improved. The thought of traveling to some small random foreign destination with Ulla terrified me for a lot of reasons. But maybe that was why I had to go. Things couldn’t get much worse. Still waiting for the train. I don’t feel very well right now, probably due to the sleep deprivation, carbon monoxide inhalation, and gin consumption, along with the fact that I haven’t eaten anything for several hours. There’s a food stall near our bench where a man is frying batches of something in a silver skillet—they look like oversized hush puppies. A woman in a dress stitched from sackcloth is standing next to him. She has a large pink basket balanced on her head, and she’s yelling “Fae-dong! Fae-dong!” at the top of her lungs, as though calling to a dog, or a small child. I’ve been watching her and thinking about buying some of whatever she’s selling. It seems like a daunting task, and I’m tempted to just sit here and starve for a while longer—but I can hear you saying: You’re hungry. You have money. She has food. How complicated could it be? Before approaching the snack-sellers, I skimmed our Puchanese Language Dictionary (which is just a hand-bound stack of mimeographed pages that Ulla bought from a kid at the airport). The English-language section didn’t follow the traditional rules of alphabetization as far as I could tell, but I figured out how to say “one” (tûan-nâa) and “please” (gà-roó-na). The woman spun around, removed her finger from her nose, and let out a startled, high-pitched gasp. “Yes, please. Tûan-nâa. Gà-roó-na. Thank you.” I gave her a big, friendly wink. The woman watched me wordlessly, straining her neck forward, then said something to the man behind the fryer. He laughed and made a suggestive movement with his hips. “Fae-dong gà-roó-na?” he repeated, smirking. The man snatched the money from me, held it up to the light, then broke into a broad, toothless grin. I smiled back and nodded serenely. He brought his hands to his forehead, bowed, then reached into his smock and counted out my change: sixteen light-blue bills and nine small coins. The woman took a step towards me, put her hands on my shoulders, and, with a shy smile, pulled me down until our faces were at the same height. It felt as if we were about to share some kind of intimate moment, and I found myself wishing that I’d taken the time to read more about the local customs. And then—in one deft motion—she removed the basket from her head and placed it onto mine. I reached up reflexively and steadied it as the woman fell to her knees, pressing her chin to the floor. “Wait, no—I don’t want to buy the whole thing.” I tried to lift the basket off my head, but it was surprisingly heavy and began to slide out of my hands, so I re-balanced it and said, “Listen, I’m sorry, but there’s been a misunderstanding.” I turned to the man, who was sorting the money in his apron. When I caught his eye he looked down and puffed out his cheeks. “No,” I said quietly. “No, no, no.” The woman was rocking back and forth on the ground, murmuring to herself. I suddenly felt dizzy, and knew that I had to go sit down. As I walked back towards Ulla, I carefully balanced the basket on my head and avoided making eye contact with any passersby. Ulla was reading the guidebook and listening to my Walkman, and for a moment I considered ditching the basket somewhere—but then she looked up, and it was too late. The interior of this train is a mishmash of different styles: ornate brass luggage racks, Modernist plastic seats, turn-of-the-century light fixtures, and orange leatherette walls printed with a subtle Op art pattern. It’s like an old World’s Fair prototype for the Locomotive of Tomorrow. When I climbed on board, struggling with my basket, the passengers gawked at me as though I held a baby dolphin in my arms. Ulla was quiet for a moment, then asked how much money I’d given them. I reluctantly told her, and, after doing some calculations, she informed me that I’d paid about $67—approximately one-fifth their annual income. The light-blue bills that they’d given to me as change were worth about twelve cents apiece. I opened one of the bags, plucked out a snack, and popped it into my mouth. It was crunchy on the outside, with a moist center that tasted like walnuts and garlic, but also like French fries and mint. It was delicious. I immediately ate another, and, after some prodding, Ulla tried one. We went through the whole bag in about a minute. Had to compose that you hardly any phrase to be able to thanks again regarding the pleasant recommendations you’ve contributed the following.